We’ve been happily grabbing our lunch from Exmouth Market Ghanaian food vendors, Jollof Pot, for over a year now and are pleased to report that the only thing we’ve seen change in this time is the size of their lunchtime queues (which has grown to be considerably long, especially on Fridays). Of course, we can’t blame anybody for queuing up for a little midday West African escape, especially since Jollof Pot makes it taste so good. We particularly like the spinach and agushi stew as well as the black-eyed peas with tomato stew … and we particularly love dousing a little (mega-super-wow) hot sauce on the side of whatever Jollof Pot item we’re eating. 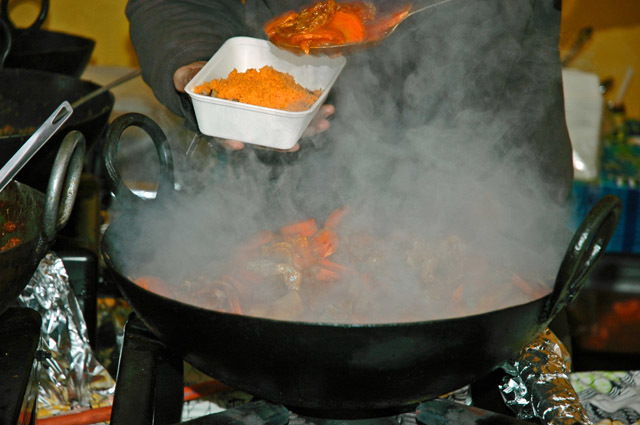 Jollof Pot also vends at Broadway Market and Portobello Road and runs a pretty mean catering service. Their flavourful Ghanaian dishes are an exotic and healthy choice served up quick and friendly (despite the occassional queue).